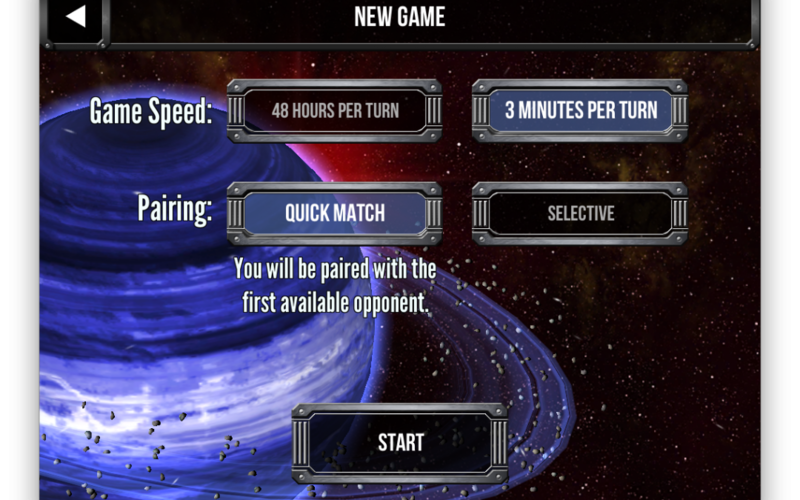 New Quick Match Feature – Find an Opponent Fast in Star Realms! As we add new expansions and options for digital play, we want to make sure that you can always quickly find an opponent to play Star Realms. 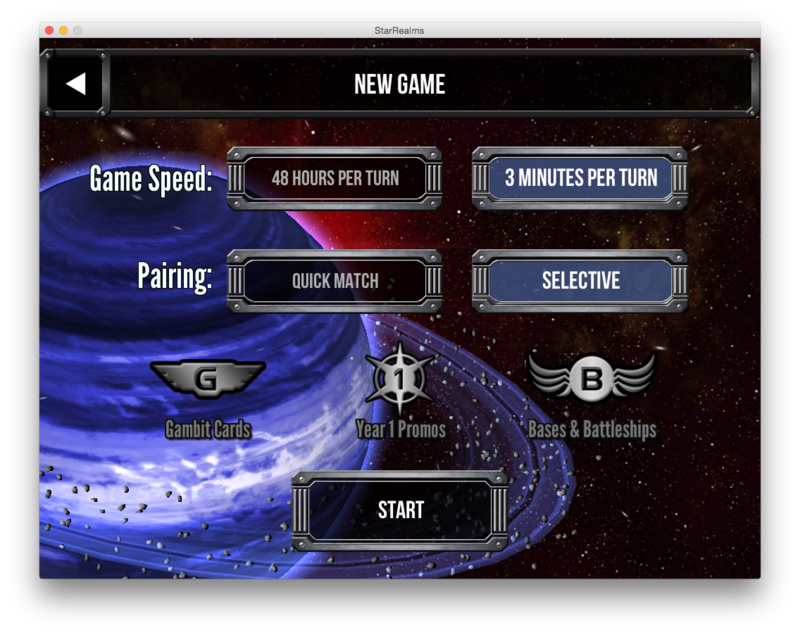 We are excited to announce the new Quick Match feature that is now available in the latest update for Star Realms on Android, PC, and Mac, and available soon for iOS devices. This update is free of charge. With the newest update, we have added the new “Quick Match” option which will pair you up with someone who is waiting for a game. If you just want to jump in and play, this is the fastest way to do it — we’ll pair you with someone who wants to start a game with sets you own, and off you go. Of course, if you want to set up an online game with specific sets, we continue to support that option as well. So if you want a fast match, just click the “Quick Match” button and you will be paired with someone who is seeking an opponent. If you want to be able to select exactly which set of expansion packs you will play with, click the “Selective” button. This will allow you to choose which of the expansion packs that you wish to play with. The sweetest thing about this new feature is that even if you don’t use “Quick Match” and you are “Selective”, it still helps you find matches faster because other people use it! Another way to get more players on Star Realms is to take the time to review the game. Apps with more positive reviews get more downloads and players, so please share your love for the game! Thank you!!! Enjoy Quick Match and let us know how you like it! Will you be adding a friends list at any point, to keep track of friends and their expansions? This would be a fabulous thing to have. A second vote for a friends system and in game chat ?? So how do I use this feature? I am a couple of updates behind now because I never received a newsletter telling me there were updates and believed my copy on PC would update itself so didn’t check here. Is there any way to match up against players of a comparable level to you? I keep getting matched up against players of a much higher level than me. Is “quick match” more likely to pair you against someone of a much higher or lower level than “selective” is? Not necessarily. In every case, we try to match you to someone of a level close to you first, moving further from your level the longer the wait is. If you happen to always select a combination that is popular with lower levels, then “quick match” probably is more likely to pair you against someone of a higher level, but overall it should be about the same.